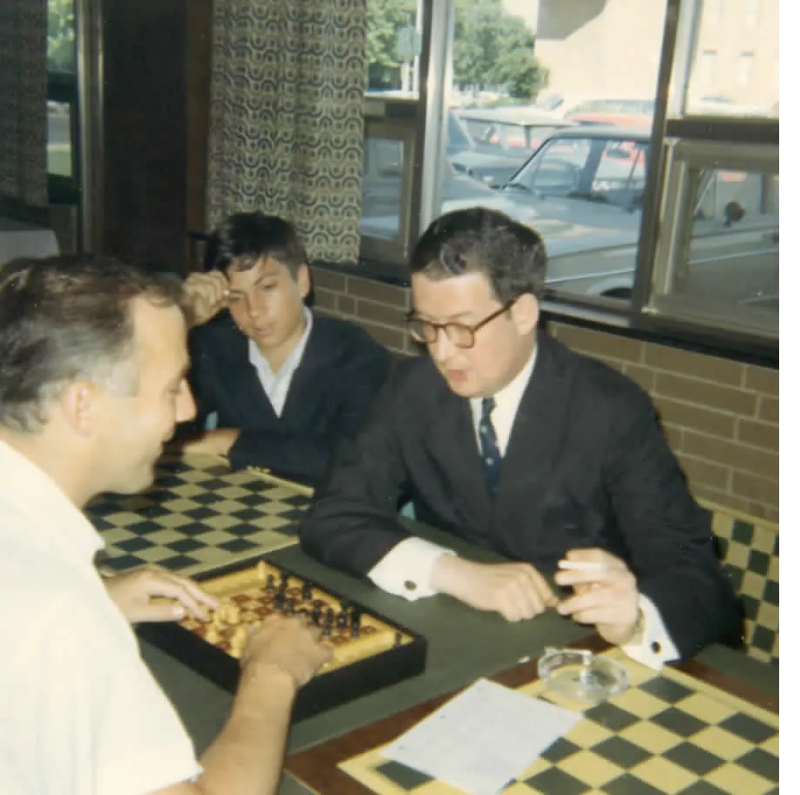 Donald Byrne is best known for losing The Game of the Century in the 1956 Rosenwald tournament to Bobby Fischer. This is great because it ensures him a type of immortality. It's also not so great since Donald Byrne was one of the great chess personalities, a superb ambassador to chess. Remembering him just for that game is like remembering Ronald Reagan just for one movie, Babe Ruth for pitching for the Red Sox in the World Series, or Stephen Tyler as an American Idol judge. IM Donald Byrne, brother of GM Robert Byrne [PS: Ironic, later this same week Robert passed away], was easily of GM strength - he won the US Open in 1953, and around that time was the second highest rated player in the US behind Samuel Reshevsky. In the 1954 radio match USA vs. USSR, D. Byrne defeated one of the top Soviet GMs, Yuri Averbach, 3-1 in their individual match. Unfortunately due to illness and lack of opportunity, Donald never got the GM title, but there was no doubt he deserved it. Even later when he was ill and unable to play as much, he was still rated in the Top 10 players in the US. "Coach, you seem to be on good terms with everyone in the chess world. Is that true?" "Yes, that is everyone except Reshevsky. But then, no one likes Reshevsky!" I was involved in trying to get FIDE to grant Donald a posthumously GM title (unsucessful for vague reasons that seemed more political than worthy), and to get Donald into the US Chess Hall of Fame (successful and I attended the dinner in the entrants' honor in 2002(? ), about 26 years after he passed away at a young age). The Penn State Chess Club has just revived the Donald Byrne Memorial Chess Tournament and I had been asked to be the honored speaker. This past weekend wife Shelly and I loaded dogs Brynn and Abbie into the car for the 3-hour drive to Penn State (It turned out to be a tough weekend for Brynn, but that's a story for a dog site!). After the second round, Penn State Chess Team Captain James Bischoff introduced Donald's son Eli Byrne, who is a Professor of Game Theory for the Penn State Math Department. Eli talked about his father's career and how much he still meant to the family, these many years after Professor Byrne's early passing in 1976 due to a long-term illness. Eli then introduced me. I primarily limited my 50-minute talk to anecdotes and stories. This seemed appropriate since Donald Byrne had a million stories, so I told some of his and some of mine. Donald Byrne always laughed til he was red telling these stories; I wasn't quite able to duplicate that! Some of these, like the Byrne Brothers and the Hustler I had written for Chess.com; another Chess.com story about Fischer's trip to the Olympiad I did not have time to relate. I told a couple of stories about The Game of the Century. One was how, after Fischer's combination, Donald canvassed the other players to see if they thought he should honor Fischer's great play by letting the young man checkmate him. They approved, of course - at that point young Bobby was not yet Bobby Fischer - as Byrne pointed out. The other story involved Byrne moving his queen's bishop to the wrong square in the opening. He was contemplating what he should do about it, when he had a strong urge to go to the bathroom(!) So he quickly picked up the bishop, put it on another square, and left the board. As he said, at that point how did he know it was going to become The Game of the Century? It was a great honor to be there. The one time I met Bobby Fischer's and Donald Byrne's coach, John Collins, I told him about my affection for Coach Byrne. Upon hearing this, Collins, who was quite elderly and frail and no longer able to speak, understood fully about his long-passed pupil, and pulled my hand over his heart in a show of great empathy. It was unforgettable. Thanks to Byrne and Collins, I am am able to proudly tell others, "My coach's coach was Bobby Fischer's coach." "This past weekend 36 participants took part in the Donald Byrne Memorial. This event gave away over $1300 in prizes over three different sections. In the top section, National Master Peter Minear and Expert Matt O'Brien won first place scoring 4 our of 5. In the Under 1600 section, newcomer Denis Aslangil and 13 year old Andrew Yang shared first place with a score of 4.5 out of 5, drawing each other. The Under 1200 section was a round robin, won in a clean sweep by Lehigh newcomer Alan Ng, 5- 0. The top team was Lehigh University. The players were able to not only be involved in a fine memorial event, but they also were able to listen to talks given by Eli Byrne, Donald Byrne's son, and Dan Heisman, one of Donald Byrne's students. Plans are already being made for next year's event, so keep an eye out for it!" In the 1940's Donald was 13 and his brother Robert (later a GM) 15. The dress code for Central Park tennis was "tennis whites" and the two teens dressed accordingly for their fun tennis match. After tennis they happened to pass an area where a park hustler was playing chess. Donald said the hustlers there tended to be in the 2200-2300 range. Older brother Robert approached the hustler and asked how much he was playing for. The answer was 25 cents per game (maybe $5 in today's money). Robert said sure, and sat down to play. They played three games, each of which Robert won easily. As with all of Coach Byrne's stories, he laughed heartily when telling it and we (the eager audience of chess club players) could never help but laugh along, too. For those of you whose only acquaintance with Donald is that he lost the Game of the Century to Bobby Fischer in 1956, Donald was a super-strong player, many times representing the US in the Chess Olympiad. After he won the US Open in 1953 (http://en.wikipedia.org/wiki/U.S._Open_Chess_Championship) I believe at that point he was the second rated player in the US behind Sammy Reshevsky. Donald Byrne is a member of the US Chess Hall of Fame. Professor Byrne, Fischer, and the rest of the US Olympiad team were on their way to Eastern Europe which was, of course, behind the Iron Curtain in those days. I suppose it had to be the one in Varna, Bulgaria, in 1962 (http://en.wikipedia.org/wiki/15th_Chess_Olympiad). The team met in central Europe (possibly Germany - it's been a while!) and then took the train toward their destination. They had a compartment where the US Team all travelled together. As you can surmise, this meant they had to cross at least one border by train. At a border the train stopped and was boarded by the military so that they could check everyone's visas and passports. Byrne related that when Fischer (who in 1962 would be age 19) realized what was going on, he got up and shut the compartment door, mumbling something about "I'm not going to let those Commies....!" The rest of the group was horrified and rushed to re-open the door to let in the heavily armed troopers. Everyone (well, except Fischer) went out of their way to be very friendly, and kind of quietly intimated "Don't mind our friend over there - he's a little eccentric..."
Luckily the troopers did not make a big deal out of it and everything turned out safe for the home team (which finished 4th in that Olympiad - take link for more info).